Today we launch Finca San Jose red bourbon from El Salvador and Gloria Rodriguez! I am sure she thinks I am crazy, as when I turn up there’s normally some kind of chaos going on, or I have some new thing that I’m trying, but with the help of her son in law Luis (also Rodriguez) we battle through. I’ve been friends with him even longer (and her Daughter his wife Maria Jose) through their joint work for the Consejo back in the day (before they went on to own their own farm La Gloria). You keeping up here? Anyway the relationship we have is amazing, they continue to do good work (the family), and I continue to buy their amazing coffee, and they continue to improve, this year is no different. 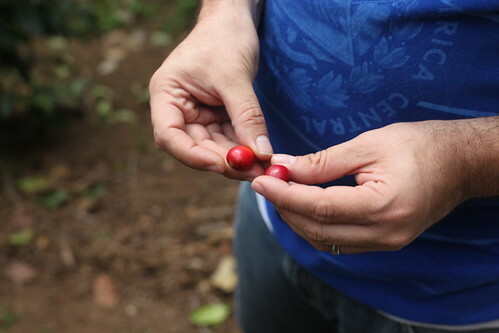 When ever I get together with Luis we end up “geeking” out about all the varietals that we have found over the previous year, and talking about ones we are seeing come to the fore. One of these is Elefante, a unusual mutation that’s been found on San Jose and Lagunita (one of their neighbouring farms). Lots of varietals have very small differences in the cherry or plant. 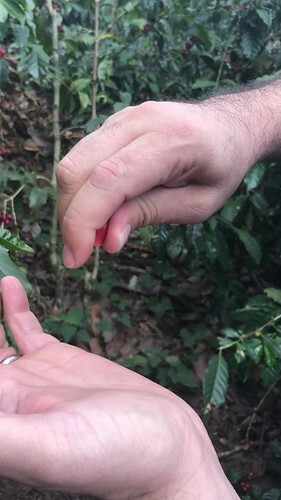 This one has huge amounts of mucilage compared to the three or four drops you get from most coffees, often producing 14 or 15. Excess mucilage means excess transfer of sweetness in the processing and I think this shows in the cup. We are also launching this today, along with a heap of pictures from my visit on Flickr which you can see here! I don’t expect the Elefante to be around long and most certainly won’t be an in my mug (way too small for that) but anyone who is signed up the red bourbon is making its way to you today.